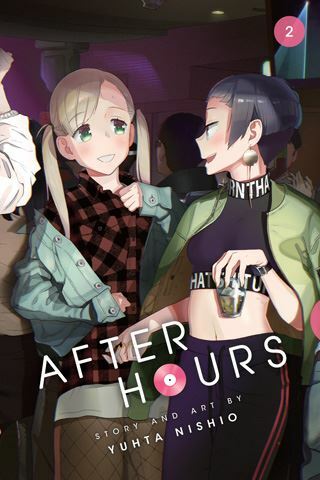 After Hours is a yuri manga from creator Yuhta Nishio. “Yuri,” also known “girls' love,” is a genre that depicts romantic situations between female characters. After Hours is the story of Emi Ashina, a 24-year-old, unemployed young woman who does not know what to do with her life. At a club, Emi meets another young woman, Kei, who is a DJ and who becomes a dear friend. In After Hours, Vol. 2 (Chapters 6 to 10), Emi and Kei tell Kei's DJ crew about their plans for a big musical event. Emi is still a little unsure of her feelings for Kei, and Emi still has an apartment and a live-in boyfriend. When Kei learns Emi's status, she turns distant with Emi, whose secrets and anxiety are starting to catch up with her. Will that ruin her new relationship? After Hours Graphic Novel Volume 2 deals with the awkward stage in a relationship, when secrets can quickly end everything. Emi is trying to find herself as both a VJ and as part of Kei's professional world. This volume is a pivotal entry in the series as far as romantic developments go. People who read Vol. 1 will want to show up for Vol. 2. I READS YOU RECOMMENDS: Fans of girls' love manga will want to try After Hours.